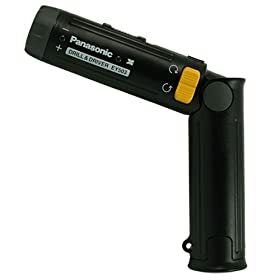 The Panasonic 2.4-Volt Ni-Cad 1/4-Inch Hex Cordless Drill/Driver is ideal for performing electronic assembly, electrical work, woodworking, and appliance repair. This professional-grade drill comes with No. 1 and No. 2 Phillips drill bits. The drill features a maximum torque of 26 inch/pounds. Its multi-stage clutch adjusts to slip as low as 3.5 inch/pounds and as high as 17.5 inch/pounds. The tool easily converts from straight to pistol grip for more accurate drilling. It features an easy-to-use thumb control. It weighs just one pound and is 9-3/8 inches in length. It is covered by a 1 year warranty. While it does include a Ni-Cad battery, this drill does not include a charger.